Still wondering what to get Mom for Mother’s Day? 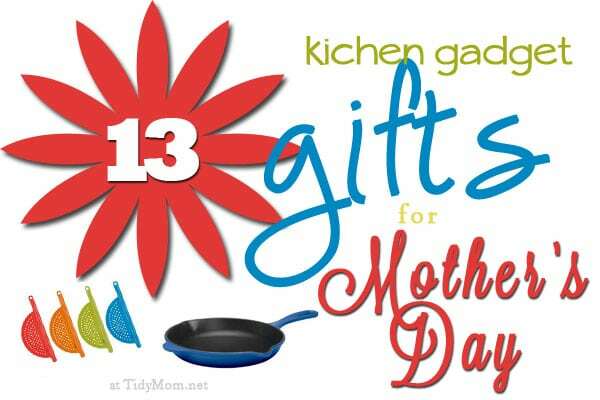 Show her how much you appreciate all of her slaving in the kitchen, by spoiling her with a new kitchen gadget. Who better to ask for kitchen ideas than food bloggers? 13. Solid Spatula – I cant live without my solid spatula. I am so tough on mine that they often fall apart or separate at the seem. This bad boy never fails me, especially when I’m whipping up a batch of my favorite butter cream! 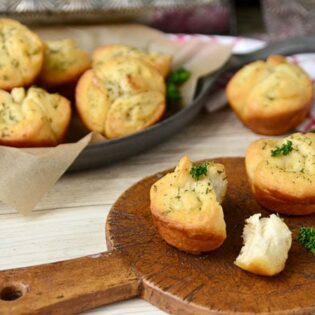 Hopefully these ideas will inspire you to stock Mom’s kitchen (or your own) with a few key quality items that will prove themselves to be invaluable for cooking and will last the test of time. My favorite is also the one piece spatula. I was always disgusted by the 2 piece ones. What’s really hiding in there? Dave does most of the cooking here and I’d say he loves his Le Creuset french oven. The Le Creuset French Oven has been on my wish list! !………I will say though, I do use and love my LC braiser a LOT! First of all….how much do I LOVE those BIG FUN RED flowers!!!! I hardly have any of these GADGETS! Would die to have that Bread Machine! Happy Mother’s Day to one of the FUNNEST mom’s I know! Alison and Heather are two lucky girls! what a great list of items…I’m a gadget girl and have lots of drawers full of fun items for the kitchen and I use them..even better 🙂 I hang my white coated metal strainer on a hook as I use it daily and I’m with Amanda on the spatula thing…LOVE my spatulas! Also tongs. I use tongs for everything. These are all fabulous! Couldn’t agree more with this selection! Loved seeing what the other girls selected. Thanks for the round-up, Cheryl! Stop right there! This is a trap! 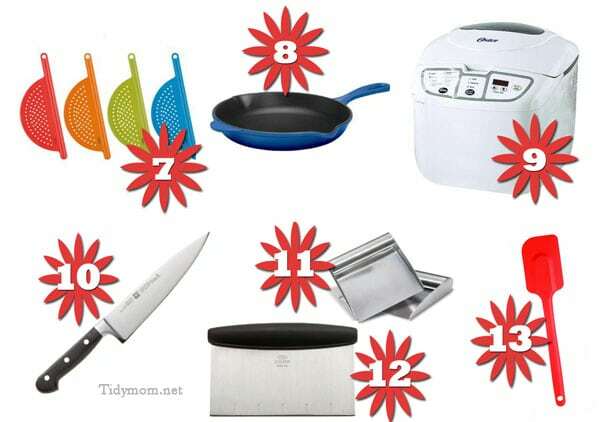 NEVER EVER EVER give a woman kitchen gadgets, appliances, tools or whatever for Mother’s Day!!! You might as well buy her a vacuum cleaner for Mother’s Day. You will pay dearly for it, until the next Hallmark Holiday comes around and you will be forced to buy her that $3000 piece of overpriced jewelry that she has secretly wanted. Haha! But in all seriousness you just really have to know the person. I asked for a pizza stone for Mother’s Day and I’m considering asking for a bread machine for Christmas. I don’t wear much jewelry chasing a toddler around all day. I’d much rather have a gift I use, but that’s me. Fun post and great picks–I agree with nearly every single blogger! awe, thanks so much Sandy……….you do too! I love kitchen gadgets so many thing to play with. I want all of these ! Cheryl, I love my ice cream scoops in a couple different sizes for scooping cookie dough or muffin/cupcake batter. A uniform scoop everytime. Also, I couldn’t get by without my stick blender. It doesn’t take up hardly any room and it’s great for smoothies, soups, whipping cream and I used to make the kid’s baby food when they were young. oooh, I need a stick blender!! I have 7 of the 13, or 8 if you count my cast iron skillet which I don’t use much in the kitchen, it’s not a pretty one, old camping style one. I love my egg slicer, I also use it for olives. I really, really want a Silpat or three. My favorite item is probably my tomato shark/strawberry huller. Oh & my scoops for cookie dough, etc although I haven’t been able to find the perfect sized one yet. I would add that my second and third would be Amy and Bridget’s mentions… couldn’t live without those in my kitchen! Oh, and ditto to #3 and #5. Use those all the time as well! So many great ideas!!! I love them all! What a fantastic list!!! I want everything on here! 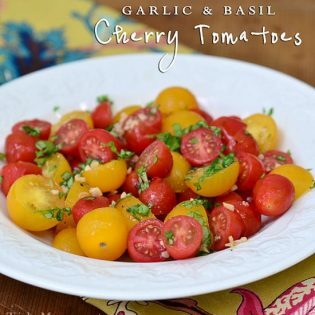 love my pampered chef garlic press and food chopper- use them daily! What a great round-up of products! I can’t live without my rice cooker! Thanks for some great ideas for kitchen gadgets! haha! Stephanie…..Shaina had a hard time deciding between her juicer and her rice cooker – she uses her’s all the time too. I don’t know if I could cook another meal without 2 things: my tongs and my kitchen shears. I think I could go to war and win with those two things! I have/had all except the egg slicer. We’re not much for hard boiled eggs. I had a bread maker but didn’t use it so I gave it to Salvation Army. I’d rather do it myself with my hands. Great List. I can’t do without my K.A.F. (made in the USA) cookie sheets, muffin pan, & loaf pan! Great products! I’m definitely a gadget gal. 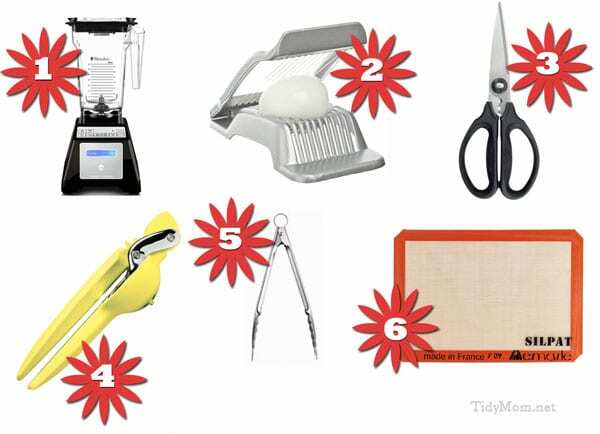 With so many it’s hard to choose a favorite but I do love my microplane and my corn stripper and Mandoline both from OXO. Great gadgets make cooking easy and effortless. I second the Silpat!!! I never bake with out it!! Cheryl, I need those food scoops. I keep meaning to buy myself one! Great roundup, Cheryl! I must agree with Sylvie – the Blendtec is amazing! I can’t cook without my KitchenAid mixer. I use if ALL the time. I also love my tongs and kitchen shears. But, the most important item I think for anyone in the kitchen is a good chef’s knife. Great list. I’m going to be looking for a pot strainer! I absolutely love my mini food processor. I use it all the time to mince and chop onions and garlic. It also makes quick work of grinding nuts to use for my tart crusts. The Le Creuset Braiser is at the top of my wish list! I have 6 of those, and I would have to add a “whisk” to that list! It is the perfect tool for mixing so many things. I have 3, and use one nearly every day. Probably the thing I use a whisk for most, is mixing pancake/waffle batter. Works great!